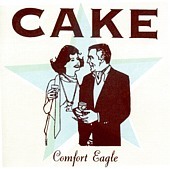 The band that defines quirky, the out-of-left-field popsters, Sacramento's Cake creates yet another feast of oft-puzzling, yet intoxicatingly arousing rock songs on their latest, Comfort Eagle. Front man John McCrea, the principal songwriter for Cake, uses his talking style of singing to tell the tale of very peculiar, though typical people he sees on a daily basis. As weird and hard to swallow as his songs are, there is something refreshing, something so unbelievable about McCrea's spin on the art of lyrics and storytelling that you can't help but fall in love with his songs. Even if you fight it hard.